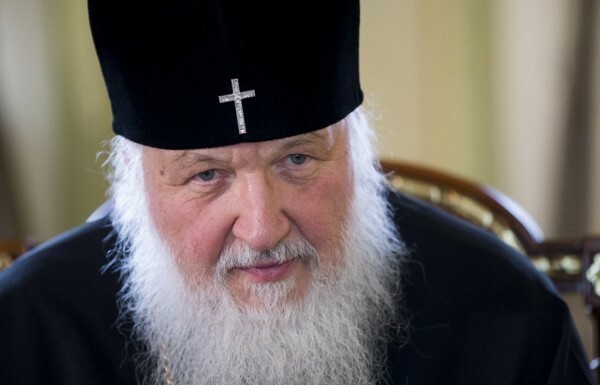 San Paulo, February 24, Interfax - Patriarch Kirill of Moscow and All Russia has told about the secrecy that surrounded preparations for his meeting with the Pope, and explained why such measures were taken. “No one was talking me out of it [from meeting with the Pope] because no one knew. Five people knew about this meeting – I am not going to tell their name them. Why was that? Because it is impossible to prepare such a meeting openly: too many opponents,” the patriarch told Russian journalists at the Brazilian city of San Paulo at the end of his Latin America tour. 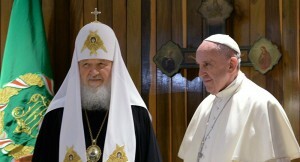 The problem was not even the Orthodox people who think “there is some danger in the meeting per se,” he said. “There are powerful forces that did not really want it, so we needed to prepare it calmly and quietly, which we did,” the primate said. The declaration that the two church leaders signed is the fruit of collective work, he said. “We finished writing the declaration a few hours before the meeting, which is proved by the text being not very well printed. We kept editing the text until the very last moment, together. 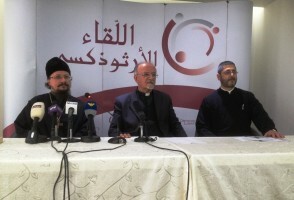 This is a product of creative work by the two Churches,” the patriarch said. “We have a high level of consensus in assessing what is happening today to the human family, in the world of politics. There is shared understanding of what a Christian’s position must be in the face of all these menacing challenges,” he said. 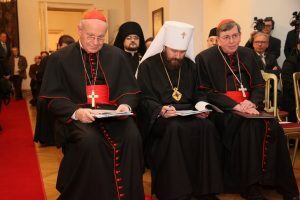 The division between the Orthodox and Catholic Churches, which has existed since the eleventh century, cannot be overcome with agreements between their leaders and hierarchs, the Christians separated “in response to our sinfulness” and “it will be a God’s miracle if we ever live to see this happen [the reunification of the Churches],” Patriarch Kirill said.